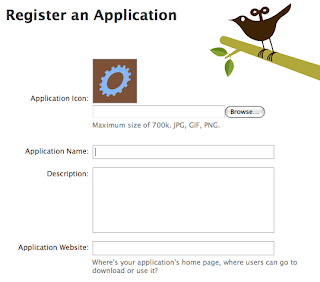 Earlier last month, Twitter released OAuth access to their site and to the API. Excited about the possibility of integrating some DigitalChalk functions with Twitter, I decided to take a couple of hours to play around with it and see what it offered. There are lots of examples on the Twitter API site, but none of them are in Java. What? Really? Maybe because it is so easy to do, but I do think that it is worth posting about. First, a little about the flow of getting your access credentials from Twitter. 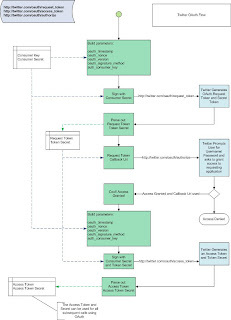 The diagram below shows the order of events and some pieces of the data that you need to get started. For my implementation example I am using a Java OAuth library written by John Kristian, Praveen Alavilli and Dirk Balfanz. The first step is get request a Request Token from Twitter. You do this by using a timestamp, nonce, oauth version, and your consumer key and signing it with your consumer secret. Then a request can be made to http://twitter.com/oauth/request_token including the signature. Save the Request Token and Token Secret off for later use. We will use them again after the user has granted us access. Build up a the URL for a user to access, sending them to Twitter, to grant us access. This will be done by sending them to http://twitter.com/oauth/authorize?oauth_token=. You can optionally add a callback URL on the parameters or just rely on the one that you entered on the Twitter site when registering your application. If you user grants you access, then your callback URL will be called. Upon recieving the callback, you now need to request and Access Token from Twitter. This is very similar to step 3 except you will be using a different URL and the Request Token and Secret that you saved off in step 4. You will sign your request with your consumer secret and the token secret and send the request for the Access Token to http://twitter.com/oauth/access_token. Twitter will generate an Access Token and Token Secret and send them back. At this point, the Application is added to the users Connections tab. Once you parse the Access Token and Token Secret out of the response, you can use them from that point forward to make Twitter API calls on behalf of the user that granted access. That is it! Now you have successfully acquired the Access tokens and can perform the Twitter REST API services for that user. 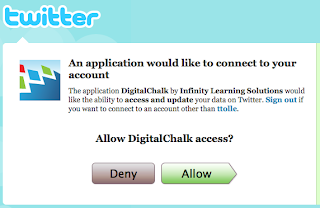 Because I have granted DigitalChalk the to update my status, the application can do so at its hearts content. using the twitter basic auth api, it is possible for the twitter account to be shared by one-or-more twitter client sites. i'm curious, i wonder if this is possible w/ the twitter oauth api as well. i wonder if the second user's authentication of the shared twitter account will invalidate the previously authenticated by a twitter oauth consumer. James, I think that I am following what you are asking. If you ask a person to authenticate again using OAuth and you complete the cycle by doing the request for the Access Token, then it will invalidate the previous Access Token and Token Secret. You will have to use the newly generated tokens to access the user's account. yeah ... it was rather clumsily asked. wasn't exactly sure of the "correct" words, but we're on the same page. James, I think that it sounds like a good idea for a 3rd party application. You could maintain a group that would have access to write to an account that you approve authentication to and then if you need to remove someone, you simply remove them from your app instead of having to change the password on the Twitter account. Go for it. I think it would be very useful. Hey Toy, If I have a web app that is already handling all the oAuth stuff, can I just store the access tokens in a DB, and then use those access tokens in my java app to make calls? If I do this do I need to include any of the oauth stuff at all? Trying to break out in your test what is needed the first time just to get the tokens, and then what you need to do the first time around, and what needs to be dont after you've already had your app approved with the user? accesstoken and tokensecret are both null. Anthony, after your user has completed the "Allow" on Twitter, you will be able to get the Access token using the request token and store them. You will then be able to use these tokens on behalf of the user. You will need to pass in your request token to get the access token after the user has allowed access through the request. It appears you are passing in null right now. Fantastic job done :-) Is there a way to download the lib jar files?Or do you have a svn url? Nautilus, that is great. I am glad it was useful to you. excellent post. as a beginner, I could understand where to start. great work. keep it up. and many thanks.